Hello, Timothy. I am advocating we understand, through no fault of their own, multiple generations of peaceful, loving human beings, no different than you or I, throughout their entire lives, from sunrise to sunset, from dusk to dawn, experienced unjust oppression and atrocities I have no doubt twisted their human minds in a thousand different ways. Timothy, I am advocating my responsible, caring, loving American neighbors recognize each of us is an individual uniquely reacting, responding and recovering from trauma we personally experienced or witnessed others experience. Sadly, we all know people whose minds were mildly or profoundly impacted by a tragic human event. Timothy, I’m advocating a theory that significant numbers of American children need protection from a population of depressed, mostly single moms apparently experiencing some type of emotional or mental illness preventing them from experiencing and embracing their innate, natural maternal instinct to place the well-being of their children Above All Else. Timothy, if you read my writing you’d learn I am advocating placing cameras in the common area of homes of caregivers establishing a track record for neglecting or maltreating their children, aka our nation’s most valuable, precious, and cherished assets. I also believe crafting laws mandating court-ordered birth control for moms requiring public assistance to raise their first child will allow an immature or emotionally ill mother time mature into her role as a maternal caregiver, experiencing the 24/7/365 challenges of parenting while acquiring practical skills so they can build a family of children who will not experience the shame, embarrassment and/or resentment from being supported by demeaning government handouts that makes some or many kids feel unequal to other American kids. Timothy, I am also advocating that every once in awhile we should consider setting aside our anger, frustration, disappointment, biases and prejudices, taking a few moments to critically evaluate social topics that often stir the emotions of significant numbers of people. Hi, David. I have often wondered how many more generations of responsible, caring, reasonably or well above educated Americans will embrace the ignorant belief or notion that American people of all colors, hues and shades are different “kinds” of people. For far too long the concept “All Men Are Created Equal” and belief each individual American has an inalienable right to peacefully enjoy our unique vision for Life, Liberty (Love) & Happiness were NOT enjoyed by all Americans. We need to recognize multiple generations of peaceful, loving people suffered centuries of unjust human oppression that today leaves significant numbers of our peaceful American neighbors feeling alienated and/or understandably angry and feeling cheated for being viewed and treated as less than human creatures not entitled to equal treatment and respect. As our intelligence blessed species continues evolving we need to shed the absurdly ignorant belief that a human being’s complexion make them a certain “kind” of person. I’ve spent nearly sixty years interacting with humans of all backgrounds. Early on, I recognized most all humans are capable of achieving greatness, as well as harming themselves or causing a lot of grief and pain for peaceful humans. I also recognize when during a critical period of human development, a human being is offered lots of affection, feels SAFE, loved and genuinely cared for, most of us will develop into fairly well-adjusted people respecting ourselves and caring about the well-being of a neighbors. 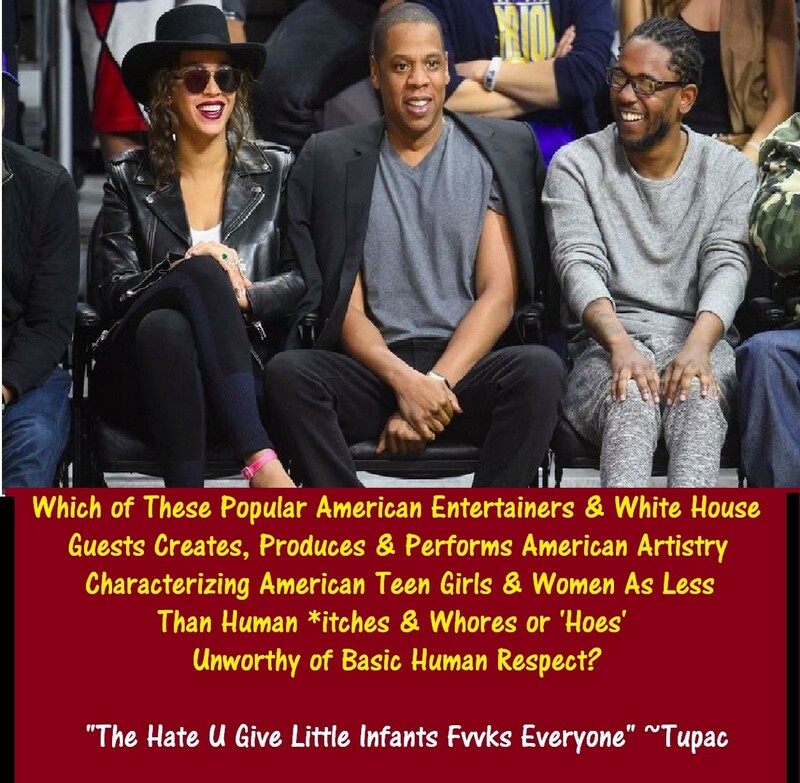 Hopefully soon most or all Americans will become one “kind” of people…people recognizing that placing Above All Else! the emotional well-being of OUR NATION’S most valuable, precious and cherished assets will no doubt result with more of us loving ourselves as well as respecting our neighbors. What I hear are young American girls speaking about a significant population of immature, irresponsible, and sometimes emotionally or mentally ill American moms failing to properly nurture and socialize their children, aka OUR NATION’S most valuable, precious and cherished resources. Most kids raised by reasonably well adjusted, responsible, affectionate, caring, genuinely loving moms do not mature into sexual predators or develop into angry teens and adults viewing American teens girls and women as less than human ^itches and ^hores or ‘hoes’ unworthy of basic human respect. Hi, Kathleen. In your experience are the responsible, caring American moms of color, or moms of other colors, shades or hues you know, affronted by a significant population of apparently depressed, angry, emotionally ill nationally and internationally popular American Urban Storytellers who for the past three decades have been creating popular American music artistry informing our nation’s children and teens as well as neighbors around our beautiful tiny blue orb that American women and teen girls, aka the maternal half of our population, should be viewed as less than human b****** and whores or ‘hoes’ unworthy of basic human respect? Kathleen, in all seriousness, to you I posed the above question. 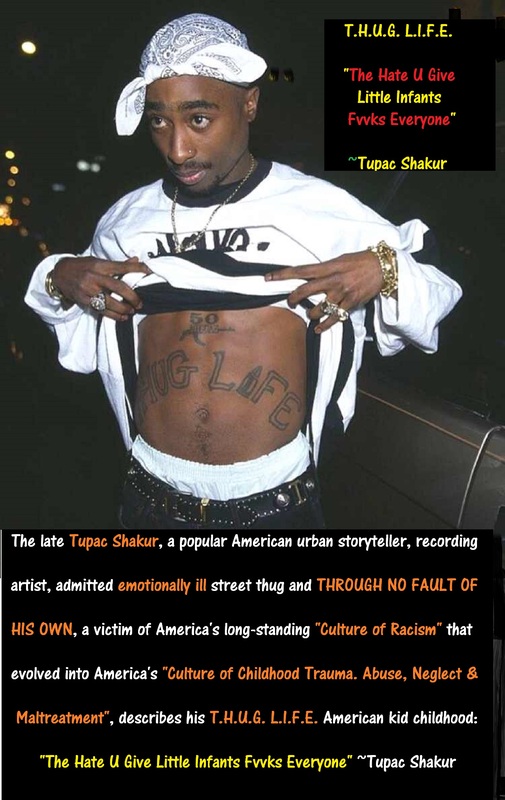 The late Tupac Shakur, a popular American urban storyteller, recording artist, admitted emotionally ill street thug and THROUGH NO FAULT OF HIS OWN, a victim of America’s long-standing “Culture of Racism” that evolved into America’s “Culture of Childhood Trauma. 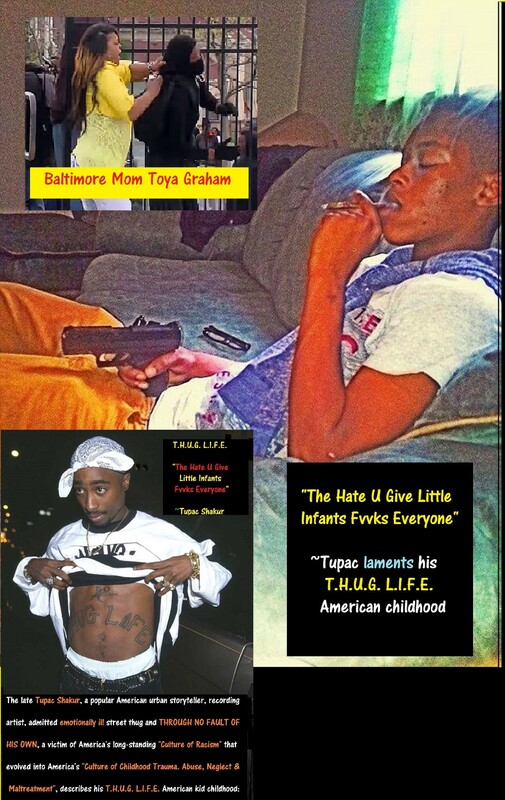 Abuse, Neglect & Maltreatment”, was assassinated for speaking TRUTHS about a “Culture of Child Abuse, Neglect & Maltreatment” depriving untold numbers of his/my American neighbors from experiencing a SAFE, fairly or wonderfully happy American kid childhood. Margery, I choose to view my neighbors, First as human beings, Second as Americans. My life experiences inform me a human being’s complexion has very little to do with their character or the values they embrace. My life experiences also tells me human beings of any shape, size, shade or hue are capable of achieving greatness, as well as embracing self and peaceful-neighbor-harming madness and/or depravity. Hi. I’ve grown weary of reading volumes of ignorance offered by close-minded, angry people replying to my comments in this thread. I’ve grown weary of replying to ignorant comments posted by angry people spouting out their ignorance and then declining to respond to my questions or engage in an intelligent factual discussion about OUR NATION’S number one current mental and physical health crisis known as CHILDHOOD TRAUMA. Like it or not CHILDHOOD TRAUMA is America’s long standing national HEALTH CRISIS responsible for significant numbers of American newborns, infants, toddlers, children and teens experiencing a potentially life scarring disease during a critical period of childhood development. It boggles my mind that’s significant numbers of my RESPONSIBLE, caring, loving, intelligent average or well-educated American neighbors decline to recognize that significant numbers of our American neighbors of color continue dealing with the emotional issues created by centuries and multiple generations of being conditioned to believe they are less than human creatures…And sadly, being TREATED by other human beings as less than human creatures. 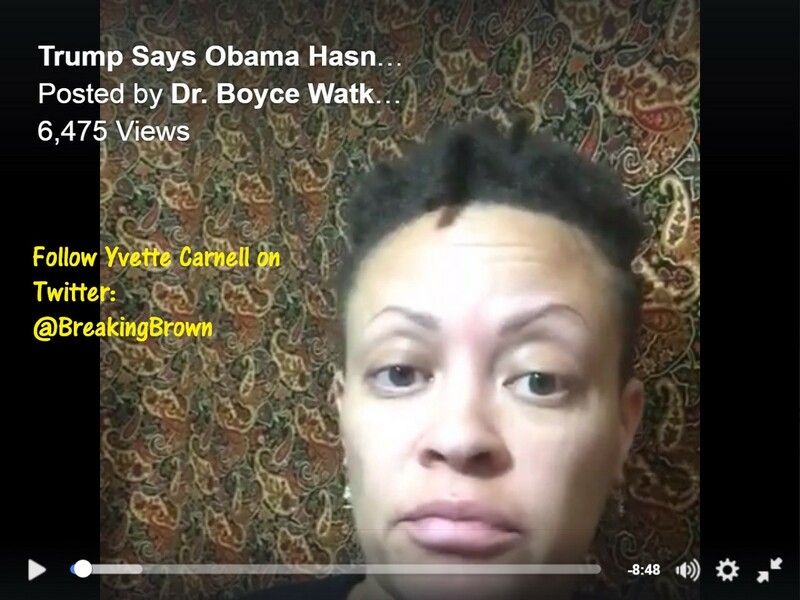 FBer Yvette Carnell shared this ‘live’ recording on Dr. Boyce Watkins — The People’s Scholar Facebook page.